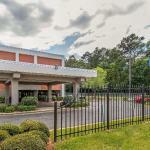 Our guests praise the convenient location free internet and generous free breakfast buffet at the Comfort Inn Jackson. This four-floor Comfort Inn Jackson offers free high-speed internet access property-wide and its 119 rooms include cable TVs with expanded channels and in-room movies free local calling mini-fridges and microwaves. Downstairs you'll find a deliciously refreshing outdoor pool and free access to a full-service health club with its own large pool extensive cardio equipment and racquetball/squash courts. In addition to the daily breakfast buffet a free manager's reception is held every Mon-Thu evening and features cold beer a hot item that varies cookies and lemonade. There's also a business center to help you out with life on the road. Parking is free. Comfort Inn Jackson is in the North Jackson Business District. The hotel is 20 minutes from a wide variety of recreational activities such as fishing boating and hiking at the Ross Barnett Reservoir. Downtown Jackson full of gorgeous Southern architecture and historically significant sites is 10 minutes from the hotel. Jackson-Evers International Airport is 12 miles away.